Understanding how freshwater assemblages have been formed and maintained is a fundamental goal in evolutionary and ecological disciplines. Here we use a historical approach to test the hypothesis of codivergence in three clades of the Chilean freshwater species assemblage. Molecular studies of freshwater crabs (Aegla: Aeglidae: Anomura) and catfish (Trichomycterus arealatus: Trichomycteridae: Teleostei) exhibited similar levels of genetic divergences of mitochondrial lineages between species of crabs and phylogroups of the catfish, suggesting a shared evolutionary history among the three clades in this species assemblage. A phylogeny was constructed for Trichomycterus areolatus under the following best-fit molecular models of evolution GTR + I + R, HKY + I, and HKY for cytochrome b, growth hormone, and rag 1 respectively. A GTR + I + R model provided the best fit for both 28S and mitochondrial loci and was used to construct both Aegla phylogenies. Three different diversification models were observed and the three groups arose during different time periods, from 2.25 to 5.05 million years ago (Ma). Cladogenesis within Trichomycterus areolatus was initiated roughly 2.25 Ma (Late Pliocene - Early Pleistocene) some 1.7 - 2.8 million years after the basal divergences observed in both Aegla clades. These results reject the hypothesis of codivergence. The similar genetic distances between terminal sister-lineages observed in these select taxa from the freshwater Chilean species assemblage were formed by different processes occurring over the last ~5.0 Ma. Dramatic changes in historic sea levels documented in the region appear to have independently shaped the evolutionary history of each group. Our study illustrates the important role that history plays in shaping a species assemblage and argues against assuming similar patterns equal a shared evolutionary history. Understanding how species assemblages have been formed and maintained is a central question in biology [1–4]. Historical processes, such as river capture and climate change, likely played significant roles in driving the formation of aquatic species assemblages [5–7], whereas ecological processes may help maintain species interactions in co-occurring species if in fact those species are interacting (i.e form a community). Understanding the relative roles these two processes have had in shaping species assemblages or communities is challenging . A logical first-step, especially in poorly studied regions, is to apply historical methods to understand how past events have shaped current patterns . In this study we apply comparative phylogeography and biogeography methods [10, 11] to test the hypotheses that historical abiotic events are responsible for generating the pattern of similar levels of genetic divergence recently observed in two diverse taxa (three clades) that are codistributed in freshwater systems of Chile. Freshwater systems in Chile are biogeographically unique and were likely impacted by changes in sea levels (Figure 1). High gradient rivers originate in the Andes Mountains (1000 - 7000 m above sea level) then flow westward to the Pacific Ocean, a distance of only 100 - 220 km . Currently, most Chilean rivers are quite isolated from each other with the most likely colonization routes between them are across drainage divides or via coastal seas . Gene flow between drainages could have occurred if rivers coalesced on the continental shelf during historical periods of low sea levels. However, the continental shelf is narrow, only 10 - 60 km, providing limited opportunity for rivers to coalesce during lowered sea levels . We predict divergence between populations would occur when sea levels are high, because the already restricted freshwater systems would have been truncated even more, thereby facilitating genetic drift and the accumulation of genetic divergence. In contrast, incipient divergence would have been erased when admixture occurred during lowered sea levels because previously isolated populations were merged. Overall, dramatic fluctuations in sea level should alter cladogenic rates. In addition, Late Pleistocene climate changes might have altered cladogenic rates due to changes in stream flow patterns and volume that altered the distribution of these organisms. Map of South America showing major river systems of Chile and Argentina and distributions of Aegla taxa and Trichomycterus areolatus clades. Compared to the Northern Hemisphere, relatively few phylogeographic or phylogenetic studies have been undertaken in southern latitudes, especially in temperate freshwater ecosystems . However, phylogeographic and phylogenetic studies of terrestrial and freshwater taxa in Chile and Argentina [15, 16] are beginning to provide insights into the evolutionary history of this important region. Because aquatic diversity in Chile is relatively depauperate [17, 18] examination of a few widespread can provide important insights into the evolutionary history of the region. For example, a phylogenetic study of freshwater crabs in the genus Aegla (Aeglidae: Anomura; [19, 20] and a phylogeographic study of the freshwater catfish (Trichomycterus areolatus: Trichomycteridae: Teleostei;  discovered similar levels of model-corrected genetic distance of mitochondrial lineages between Aegla (cytochrome oxidase I and II genes: 1598 base pairs) and Trichomycterus (cytochrome b: 1137 base pairs). For example, genetic distance between two rivers, Río Maipo and Río Maule, are 2.6 - 2.8% and 2.0 - 2.8% in Aegla laevis and Trichomycterus areolatus respectively. In addition, genetic distances between codistributed sister-lineages are similar. For example, sister-clades (phylogroups: D + E: Figure 2) in Trichomycterus areolatus and sister-taxa Aegla bahamondei + A. occidentalis have overlapping divergence values of 1.0 - 2.3% and 1.7% respectively. Two codistributed phylogroups in Trichomycterus areolatus (clades F + G) and within Aegla abtao have similar, but non-overlapping, divergence values of 3.3 - 4.8% and 2.4 - 3.2% respectively (see  for further discussion). Similar levels of genetic distance between contemporary lineages suggest these taxa may have been influenced by the same events. Finally both taxa are codistributed and often sympatric in the region suggesting both may have been similarly affected by the abiotic events that have shaped the region [13, 20–23]. Species trees of three Chilean freshwater taxa, climate change and major episodes of sea level changes documented over the last 6 million years. Sea level changes (in blue, with max/min-bars) estimated from the Bay of Tongoy, Chile (Figure 1;). Jagged lines indicate climate change inferred from benthic δ18O obtained from 57 globally distributed sites . Pleistocene period indicated with gray background. Lower boundary of the Miocene epoch showed with a vertical dashed line. Species of Aegla with asterisks occur in Argentina. Letters refer to nodes discussed in the text and table 1. Posterior probabilities for nodes are below or next to node labels. Horizontal dashed lines are the 95% HPD estimates of the node dates. In this study we test the hypothesis of codivergence between Aegla species and Trichomycterus phylogroups. In other words, are the same historical events documented in the region responsible for generating the nearly identical levels of genetic divergence observed in these taxa? Four major geological and climate events may have played a role in shaping the evolutionary history of these taxa. First, the establishment of freshwater systems in the region that were precursors to current day drainages, some nine million years ago (Ma), may have driven initial lineage splitting [12, 21]. Second, two dramatic fluctuations in sea-levels (~5.0 Ma and ~2.0 Ma: ) documented in the region might have altered cladogenic rates. Finally, the relatively high amplitude climate oscillations experienced during the last million years of the Pleistocene might have increased or decreased speciation rates [25, 26]. We generate specific predictions on the type of diversification models expected based on the impact of these abiotic events (Table 1). Furthermore we predict that if these shared events shaped genetic patterns across codistributed taxa, we expect to detect identical cladogenic rates and similar dates of lineage splitting in Aegla and Trichomycterus. To this end we examine the fit of six models of diversification to the catfish and crab phylogenies. In addition, we determined splitting times for major nodes. We reject the hypothesis of codivergence if both models of diversification and times of divergence differ across taxa. Hypothesized outcomes on cladogenic rates caused by major geological and climatic events documented in the region. Estimates of the ages of major nodes in the Trichomycterus areolatus and Aegla phylogenies (Figure 2). Mean estimates and 95% HPD are given in millions of years before present. Values in bold fall within the last 1 Ma, italics designates dates that are Miocene origin, all others are Pliocene or Early Pleistocene (> 1 Ma) origin. Effective sample sizes for node estimates were over 500 (as were most parameters); thus, we assume the results are from thoroughly sampled analyses. Models selected using AIC for Trichomycterus areolatus were GTR + I + R, HKY + I, and HKY for cyt-b, gh, and rag1 respectively. The GTR + I + R model provided the best fit for both 28S and mitochondrial loci for both of the Aegla datasets. Nuclear mutation rates estimated from the analyses are as follows: Trichomycterus areolatus (rag1 = 4.48 × 10-4 [2.34 × 10-4 - 6.79 × 10-4] and gh = 1.24 × 10-3 [7.41 × 10-4 - 1.81 × 10-3]), AeglaA (28S = 1.63 × 10-3 [7.25 × 10-4 - 2.58 × 10-3], AeglaB (28S = 1.04 × 10-3 [5.38 × 10-4 - 1.60 × 10-3]. The best-fitting model of diversification (Table 3) for Trichomycterus was pure-birth (delta AICrc = 1.36, p = 0.21), whereas the logistic density dependent model provided the best fit for AeglaA (delta AICrc = 7.79, p = 0.02). A rate-variable birth-death (rvbd) model was the best model for AeglaB (delta AICrc = 5.47, p = 0.03). Results of maximum likelihood tests of diversification models. Shown are best constant and best variable rate models selected from six candidate models. Tests of significance were conducted by simulating 5000 phylogenies under a constant birth-death model. The best constant model was rejected if the ΔAICrc was significant (two-tailed alpha = 0.05,). DDL is a logistic density dependent model and rvbd is a rate-variable birth-death model. The best-fitting model is in bold. This study was motivated by the observation of similar levels of genetic distances between lineages in three clades that are codistributed in freshwater systems of Chile. Our goal was to determine if this pattern was the result of codivergence driven by historical abiotic events. We discuss the temporal origins of the three groups. Then we discuss results of diversification tests and mechanisms that are postulated to have shaped this assemblage of freshwater taxa. Lineage splitting time (mean) estimates of basal nodes vary considerably (2.18 - 4.50 Ma), suggesting different processes generated initial cladogenesis (Table 2 and Figure 2). The confidence intervals of the two crab groups overlap considerably, suggesting similar temporal origins. However, different models of cladogensis were recovered for these two groups suggesting different processes have shaped these two groups (see next section). The hypothesis that the original formation of river systems in the region some 9 Ma [12, 21] played a role in shaping this fauna is rejected. However the exceptionally high sea levels that occurred from 5.0 to 4.2 Ma are consistent with the origins of both Aegla clades (Table 2 and Figure 2; ). Cladogenesis within Trichomycterus areolatus occurred relatively recently (~2.25 Ma) and is consistent with a period of low sea levels. This time period is also consistent with the second set of cladogenic events observed within AeglaB. The majority of cladogenic events within T. areolatus appear in the Pleistocene with the last two events dating to a period (< 1 Ma) of high amplitude climate oscillations (Table 2 and Figure 2). Only three cladogenic events occurred during the last 1 Ma in the two crab clades. The relatively few cladogenic events observed during the last 1 Ma reject the hypothesis that the especially high amplitude climate cycles of this period played a significant role in driving cladogensis within these taxa . Three different models of diversification were supported rejecting the hypothesis of codivergence among taxa. The pure birth model of diversification best explains cladogenesis within Trichomycterus areolatus and suggests that the rate initiated in this taxon was maintained throughout its evolutionary history and argues against any significant impact on rates by later sea-level changes or climate oscillations. A density-dependent model of declining diversification is the best explanation of cladogenesis in AeglaA. Declines in diversification rates can occur for several reasons, but are most notable in adaptive radiations [27, 28]. Speciation rates can decline as available niches become filled with the accumulation of species  or if an underparameterized model of molecular evolution is employed . The molecular models employed in this study are relatively complex suggesting the rate decline is not an artifact of the analysis. Alternatively, the rate decline could be due to increased extinction rates. To our knowledge, no empirical data exist on population sizes in Aegla, thus we can only make broad assumptions on the relative sizes of populations and their susceptibility to extinction. The distributions of several species of Chilean Aegla are restricted to single or several adjoining river system suggesting small populations ; Figure 1). Restricted and fragmented distributions coupled with small isolated populations in some species  suggest that population sizes are small, possibly increasing the risk of extinction . In addition, population sizes, inferred from estimates of genetic diversity, are low and declining in one crab species, Aegla alacalufi . Alternatively, especially high amplitude climate cycles over the last one million years may have increased extinction. Only one lineage splitting event dates to the Late Pleistocene (< 1 Ma) rejecting the hypothesis that this period was a driver of speciation. Rather the decline in diversification suggests that the Late Pleistocene climate cycles, or the lowered sea levels of ~ 2 Ma, may have inhibited speciation or increased extinction within AeglaA. A phylogeographic study of Aegla alacalufi recovered deeper divergence between non-glaciated populations than between glaciated populations . Many of the drainage systems inhabited by Chilean Aegla species were covered at least partially by ice during the last and presumably previous glacial cycles [13, 16]. It is likely then that repeated glacial cycles coupled with small population sizes in many Aegla species inhibited diversification by increasing extinction rates. The rate-variable model best explains diversification in AeglaB and suggests that this clade experienced a more dynamic evolutionary history than the other clades. That is the onset of cladogenesis initiated approximately 5 Ma were later altered by abiotic events. A second cluster of cladogenic events begins 1.44 Ma (node H) which is a time consistent with both lowered sea levels and the onset of high amplitude glacial cycles, suggesting that these these events increased diversification. Thus in contrast to AeglaA and Trichomycterus areolatus this period is postulated to be a driver of cladogenesis in AeglaB. Historical approaches have been used extensively in the study of codivergence in host-parasite systems . For example, the assumption that pattern equaled process in hantavirus was assumed because the virus phylogeny formed three primary clades that coincided with the three rodent subfamilies that formed their hosts and the fact that there is a high degree of host specificity in the system . However,  were able to reject the hypothesis of codivergence between the hantavirus virus and their mammalian hosts. In this study historical methods were employed to determine if abiotic events were possibly responsible for driving diversification in these clades, which in turn allows us to test the hypothesis of codivergence. The observation of similar levels of genetic distance between major lineags among these taxa suggests that they are the result of either shared evolutionary or ecological processes. Our study illustrates the important role that history can play in shaping current patterns and argues against assuming that the observation of similar patterns among codistributed taxa equals a shared history . It remains to be determined how, if any, ecological interactions have shaped this species assemblage. Results from two different methodological approaches reject the hypothesis of codivergence among our three focal groups. Rather these representatives of the Chilean freshwater assemblage evolved through temporally-independent processes. Although this freshwater fauna is relatively depauperate additional taxa need to be studied to determine if this is a pervasive observation in freshwater systems of Chile and how ecological interactions are currently operating on the entire species assemblage. This study illustrates the importance of using historical methods to test hypotheses on how contemporary patterns have been formed and cautions against assuming that congruent patterns are the result of shared processes or ecological interactions alone. 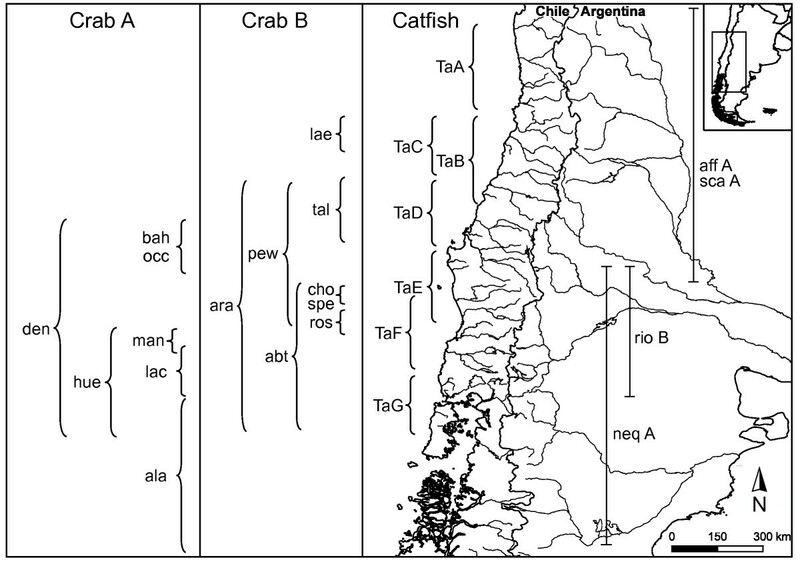 The catfish Trichomycterus areolatus and 21 species of Aegla crabs were studied from the southern temperate freshwater river systems of Chile (Figure 1). Trichomycterus areolatus is an abundant and widespread freshwater fish with broad ecological tolerances . Data for Trichomycterus areolatus are the mitochondrial cytochrome b gene (1137 base-pairs, [bp] GenBank accession numbers FJ772091 - FJ772237) and two newly obtained nuclear loci (growth hormone [1491 bp: JN186609 - JN186714] and rag1 [992 bp: JN186409 - JN186531]) from 63 individuals comprising seven clades . 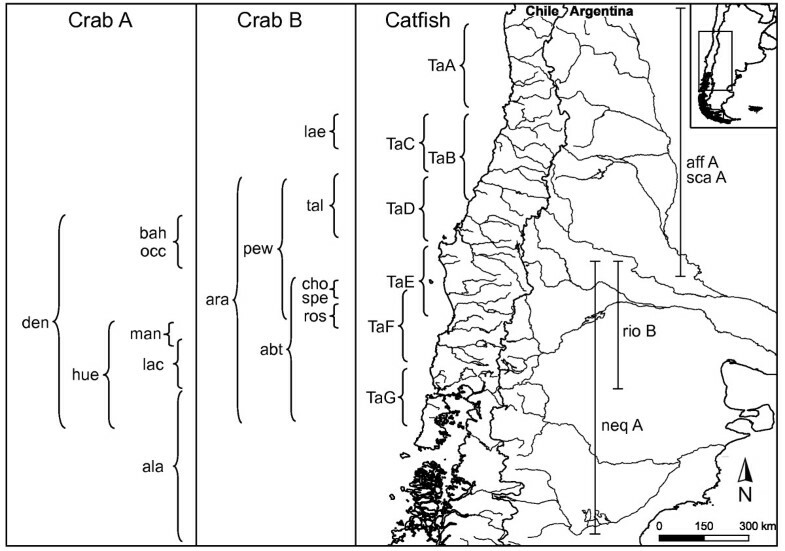 Like the catfish, Chilean Aegla crabs are widely distributed and occur in a variety of freshwater habitats . Two non-sister clades of mostly Chilean Aegla species were examined [19, 23]. The first clade, hereafter referred to as AeglaA, includes nine taxa, the second, AeglaB, consists of twelve taxa . Molecular data for Aegla consisted of the cytochrome oxidase I and II genes (1598 bp: AY049985-050166) and the nuclear 28S gene (3105 bp: AY595931 - AY595973, AY596092 - AY596093), and 20 and 24 individuals from AeglaA and AeglaB, respectively [19, 20, 23]. The best-fitting model of molecular evolution for each locus was determined using the Akaike Information Criterion (AIC) in jModeltest . A species tree and dates of major nodes were estimated simultaneously using *BEAST  as implemented in Beast 1.6.1 . A Yule tree prior, piecewise linear and constant-root population size model and lognormal molecular clock were assumed. Analyses were run 5.0 × 107 generations with a burn-in of 10% . We assumed a mitochondrial mutation rate of 1.0 × 10-8 , and a range of 8.3 × 10-9- 1.3 × 10-8 [45, 46] for Trichomycterus areolatus and Aegla, respectively. Mutation rates for all nuclear markers were estimated, relative to the mitochondrial rate, using a normal prior. Due to uncertainty in the appropriate outgroup a midpoint root was used to root the Trichomycterus areolatus phylogeny . Two individuals of Aegla papudo (cytochrome I: AY050077 - AY050078; cytochrome II: AY050121-AY050121; 28S: AY595929 - AY595930) were used to root the Aegla phylogeny [19, 20, 23]. Mean divergence estimates in millions of years and their 95% confidence intervals were obtained for all nodes using TRACER v1.4 . If dates of major nodes or their confidence intervals overlap with abiotic events (i.e., sea level changes; Table 1), we assume those events may have been responsible for driving divergence at those nodes . The hypothesis of codivergence predicts the same process of cladogenesis should be observed across taxa. To this end we evaluate the fit of six explicit models of diversification to each of the three phylogenies using a maximum likelihood test implemented in LASER . In general, these models provide the means to determine if cladogenic rates were altered (i.e. by abiotic events), or remained constant (no effect), during the phylogenetic history of each group. If these taxa codiverged, due to shared historical events, we expect each to have evolved under the same model. The six models compared were: Yule pure-birth, birth-death, logistic density-dependent, exponential density-dependent, Yule two-rate, and a rate-variable birth-death model. These models capture expected patterns of cladogenesis under various historical scenarios (Table 1). For example, if changes in Pliocene sea levels altered rates, we expect to observe an instantaneous shift in rates. Similarly, we would observe a shift in rates if Late Pleistocene climate change increased lineage splitting. Under these two scenarios, we expect to observe either a Yule two-rate or rate-variable birth-death model. In contrast, if Late Pleistocene climate change decreased diversification, through increased extinction or decreased speciation, we would expect to detect either a logistic or exponential density dependent model. Finally, constant models (Yule pure-birth or birth-death) are the expected outcome if climate and sea level changes had no impact on speciation rates (pure-birth and birth-death models assume no extinction has occurred). The best constant (RC) and best rate variable (RV) model were determined using (AIC). Delta AICrc (= AICRC - AICRV) was used as a test statistic. Significance of each delta AICrc was determined using null distributions derived from 5,000 trees simulated under a constant birth-death (extinction = lineage splitting) model (two-tailed alpha = 0.05, ). Our objective in this study was to investigate processes of cladogenesis in codistributed taxa with similar genetic distances between evolutionarily distinct lineages. Unmack et al  phylogeographic study of Trichomycterus areolatus recovered seven well-supported terminal clades with little to no geographical overlap between them. 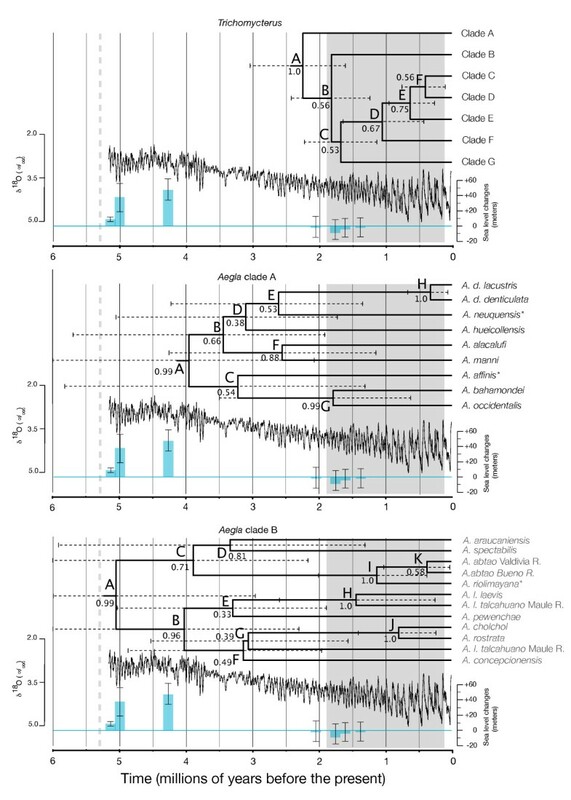 These clades had model-corrected sequence divergences between them greater than many recognized species (> 2%: e.g. [11, 50]). These observations qualify the seven clades as evolutionarily distinct lineages under several concepts including evolutionarily significant units (ESU: ) and the phylogenetic species concept . Therefore, we recognized each of the seven clades recovered in Trichomycterus areolatus as taxonomically equivalent to the currently recognized species as well as several recently discovered lineages in Aegla. This work was funded by a grant from the U.S. National Science Foundation (NSF) PIRE program (OISE 0530267) to support collaborative research on Patagonian Biodiversity among the following institutions (listed alphabetically): Brigham Young University, Centro Nacional Patagónico (AR), Dalhousie University, Instituto Botánico Darwinion (AR), Universidad Austral de Chile, Universidad Nacional del Comahue, Universidad de Concepción, and George Washington University. BRB and JBJ conceived the study. BRB conducted analyses and wrote the paper. BRB and PJU created figures. PJU, MPL, KAC and JBJ generated data. All authors read and approved the final manuscript.